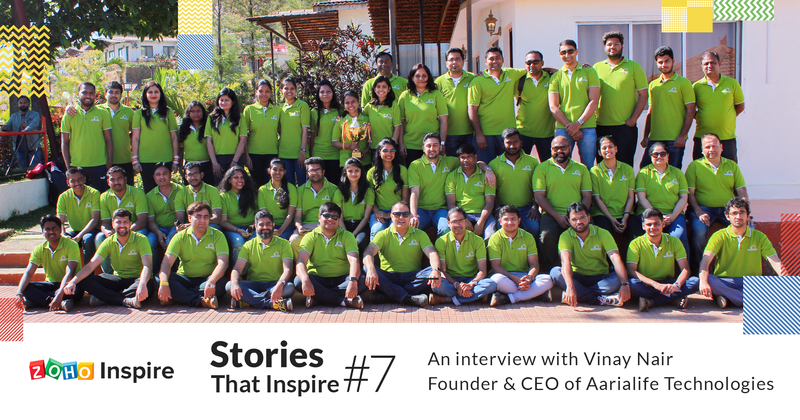 In the 7th episode of Stories That Inspire, Vinay Nair, founder of Aarialife Technologies, tells us the story of his entrepreneurial endeavor. 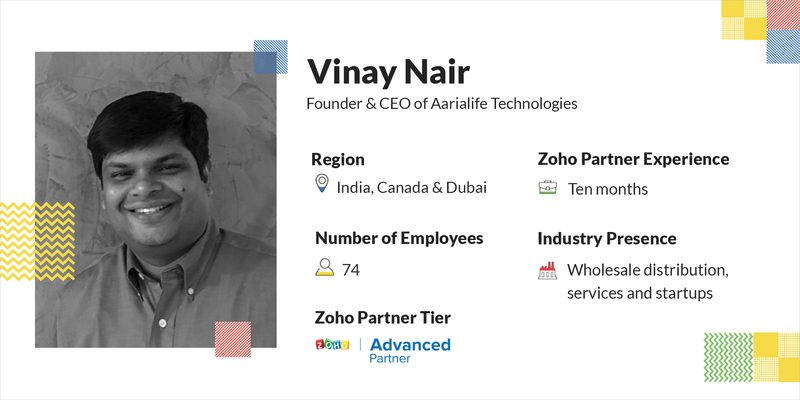 From starting out in business at the young age of 26, to going on an educational detour to Harvard, and figuring out his alignment with Sridhar’s vision for Zoho, Aarialife is now the fastest growing partner! Adhya: How did you come to love technology? Vinay: The internet had always fascinated me. During the ’90s, when I was in college, I got myself engaged in part-time positions. It was a time when the internet had just entered India. So, one of my contractual stints had me talking about the potential that the internet brings along. Those were the days when people were hooked with dial-up connections and played with shell command prompts for data exchange. The internet was nascent, and I went around talking technology to the subscribers of the net! Adhya: So, when was your first professional connection with IT? Vinay: My initial interaction with technology happened just after I graduated from college. Arvind Mills, a manufacturing firm in Ahmedabad marked my first step into the technical world. I was a part of its IT department and my first project was an SAP rollout for the company. This became my first exposure to an enterprise application. Adhya: How did the shift to SaaS happen? Vinay: After my stint in Arvind Mills, I moved into Pune to work for Kale consultants in 2001. They were the leaders of airlines software. I was a member of their network assistance team, tasked with the responsibility of hosting the client-server based applications on the internet. I got an opportunity to travel to the data centers and get a glimpse into how applications are hosted on the web. Back in my college days, I just preached about the internet as a dilettante, but this was real-time exposure to the knowledge that anything could be accessed over the internet! Adhya: …and how did entrepreneurship come into the picture? Vinay: After a couple of years at Kale, one of my relatives wanted to build a business around the IT industry. I was just 26 when he approached me to shape his business as an intrapreneur. Given my upbringing in Gujarat, one of the largest business community, I guess, I was also unknowingly inclined towards entrepreneurship. Now that I had an investor from my own family, I felt that it would be a fantastic opportunity! Adhya: That’s very young! Were you ever worried about what would happen if things didn’t go according to plan? Vinay: Well, I was 26 and had just got married, so my mind was entirely focused on the future. My wife was doing her PhD then. So, I felt that even if I didn’t make the cut, she would always be there to support me both financially and emotionally. We both had discussed this idea before stepping into the boat. Our decision was to give it some time of 2 or 3 years before making the final call. And that’s how my entrepreneurial journey started! Adhya: What were your initial struggles with setting up the company? Vinay: Getting started was hard on us. We wanted to be an IT company, but we weren’t certain about what we needed to do. Gradually, we figured out the potential behind business applications. It was 2003, and there weren’t many in the Indian market so we decided to do something on the cloud. Back then, Salesforce and Netsuite were the only two solutions and we narrowed down on Netsuite for the breadth of functionalities it came with. Adhya: How were your first few years into business? Vinay: It was very challenging. Despite the immense potential in the products, people would revert with, “Oh! It doesn’t work without internet?”, and that would be about it. The Internet at that time was inconsistent. BSNL was the sole internet service provider in India. This made our first couple of years pretty rough with almost no clients. By that time, all my colleagues were in a steady job and I was pondering the path I chose to take! Adhya: What was your feeling then? Vinay: Since we’d already given 2 years to the business, I felt that we need to go through the motion for another year too. Fortunately, the following year, 2006, changed our entire game! Adhya: What happened that year? “Vinay, all these years we were just about distribution, but for promoting Purit, we want to know our customers. We need a CRM, call center system, and an inventory management system. We are very particular about moving onto the cloud because we don’t know where our shops will be set. So, we need something that runs entirely on the internet”. So, Chennai was their pilot area. They’d set up safe water zones across the city to sell water purifiers in every home at a given area. So, we configured a system with Netsuite to keep track of the data from the system. We basically competed against Microsoft and SAP. Unilever liked what we’d offered and this gave us our first big break! Till today, this stands as the largest cloud-based deal in India. The solution involved 2000 users in India, and expanded to 9 more countries globally! Vinay: Absolutely! It set us on the path to growth. Very soon, we landed multiple enterprise. Consequently, we set up offices in Dubai and Canada. By 2016, I’d grown the company to around $6 million dollars in revenue. Gradually, I figured out what needed to be done next. Adhya: So, what was next? 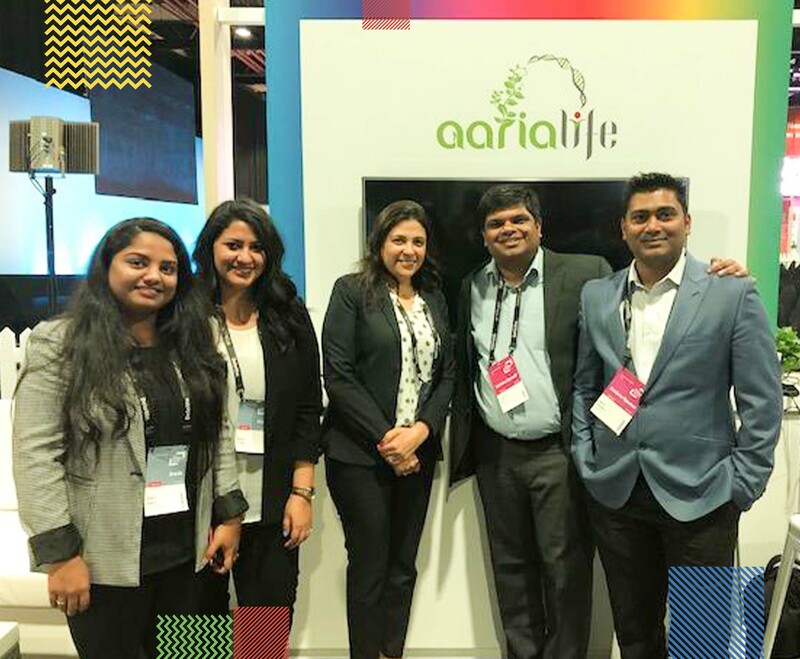 Vinay: With such massive growth in my business, I was able to invest in my wife’s venture into entrepreneurship, and in 2009, Aaria Biolife was born. Given her science background our vision was to eradicate environmental issues with the help of science. So, we focused on the agriculture sector and began with manufacturing organic agri inputs. Today, this is being used by 30,000+ farmers. Adhya: So, how did the IT wing of Aarialife happen? In 2016, I decided to move out of my engagement with the IT sector and went on a year’s recess. I had started business at a very young age and had no time to complete my higher education. I had also found a passion in entrepreneurship and wanted to know more about growing a business. That’s when I came across a one year course at Harvard, for which I had to be in Boston for 2-3 weeks in a quarter. I felt that the timing was just right to start there. My exposure and experience in the Harvard ecosystem gave me a new perspective towards business. 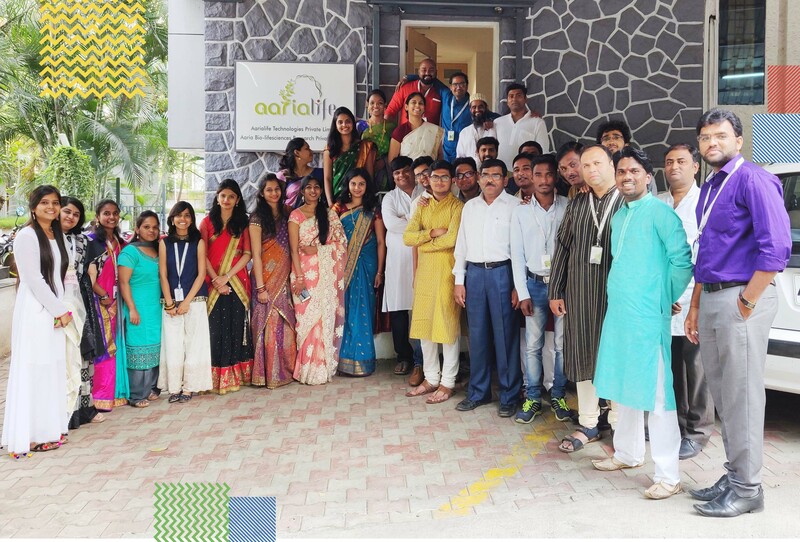 It inspired me to restart my IT business, and in 2018, Aarialife Technologies happened. This time, I had my vision very clearly laid out – technology for the greater good. The core team was formed by my colleagues from my previous business who were eager to collaborate once again. Adhya: Last time you were with Salesforce and Netsuite. Who were your product partners this time? Vinay: The first step of Aarialife Technologies was to take up the Netsuite partnership. We’d been very successful together previously, and they wanted us to continue the legacy. The second in line was Zoho. Adhya: Netsuite has been with you all through your entrepreneurial journey. What’s the connection? Vinay: Netsuite comes across as a cloud-based ERP, with accounting, inventory, finance, and above all, the branding of Oracle. When we approached Netsuite back in 2003, they did not have any office or partnerships outside of the US and were surprised with my request from India. So, in 2003 we became the first Netsuite partner outside of the US, and today, our association cotinues. Adhya: This time, what made you pick Zoho over Salesforce? Vinay: With Salesforce, I was restricted to just CRM. So, if a prospect says that they don’t need a CRM, then my doors to the company are actually shut. But, my vision was to sell to any section of a major business, and Zoho was a natural fit with its 40+ applications that can run an entire business on the cloud, perfectly complimenting to my Netsuite’s offering. Also, all through my life, I worked with American products, but deep down, my heart craved for something from my home country. Coincidentally, I came across one of Sridhar’s videos at Tenkasi and that’d struck my heart strings! Zoho was a natural fit into my principles of business. Adhya: You resonate a lot with Sridhar’s vision for Zoho! Vinay: Indeed, I am aligned to Sridhar’s school of thought. But this was not something that I read, and then fit my business model to. It was the way we were, even before coming to learn about Zoho University and the recruitment processes at Zoho. We also hire people from second and third tier cities who come from a lower-middle to middle class income background. We also work on providing internships and creating opportunities for the differently-abled because we want everyone with the skill to get a chance to express it. My first 12 years into entrepreneurship were all about money and closing clients, but today, Sridhar’s vision has given me an entirely new perspective on running the show. Adhya: With two products under the same banner, how was your focus divided? Vinay: Initially, Zoho was only an option when people said no to Netsuite. This was my approach in the start. I was like everyone else who thought that Zoho was just about CRM. But the very instant I got introduced to Zoho’s product range, I was blown away! Zoho is indeed a pioneer of digital transformation that gave me a full platter of products. Almost instantly, Zoho also became our mainstream practice. Adhya: How different is Zoho from all the other products you’d worked with? Vinay: Firstly, it is about the people in Zoho; there’s an Indian touch to everything. The company always puts the client’s need above all with the primary focus revolving around creating a difference. Revenue and other aspects of business have always been secondary. The next, would be the product catalogue of Zoho; there’s always one for every business need in existence. The final differentiator would be the amazing management at Zoho who are humble and always approachable! Adhya: How has the journey with Zoho been since then? Vinay: Zoho has indeed surprised me. 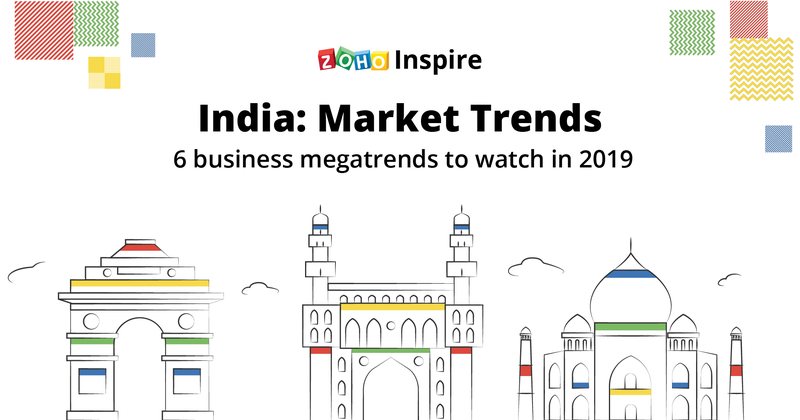 We started selling Zoho in May 2018. Today, we’ve got 112 clients spread across 12 countries in less than a year. Ambi and Tonia had mentioned that ours was the fastest to scale to the advanced partner tier. It is a serious business now and we’ve begun investing in practice. Adhya: That’s fantastic growth! How are you planning on carrying forward your momentum? Vinay: We’ve collaborated with Zoho management to figure out what more we can do. Our logical choice was to extend the Zoho offering from our offices in Dubai and Toronto. In fact, we landed a sizeable deal of $60,000+ for a utility company in Dubai. Also, a recent discussion with Zoho had put us on the path to the enterprise market. We are intend to partner with the EBS (Enterprise Business Solutions) team and both of us are now working towards a common goal. Adhya: So, what is your marketing game plan now? If you call someone, you are a sales guy. But, if someone calls you, you are a consultant. So, 70% of our efforts are on inbound marketing. In fact, we’ve very recently updated our website to a clean layout and even started to write blogs. 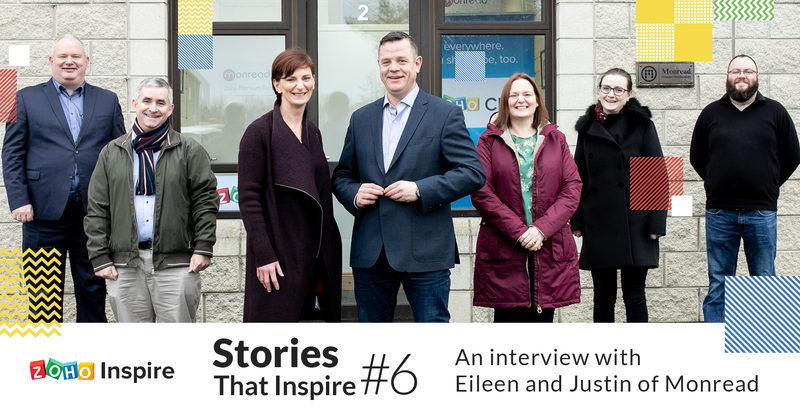 We’ve also got a couple of videos on customer success stories lined up on our inbound marketing plan. Zoho has been very kind to help us with it. Although inbound is our focus for the present, we will also be engaged in outbound marketing with our feet to the grounds of the territories where we’ve got a physical office. Adhya: What are your plans for this year? Vinay: For this year, we’ll also be targeting enterprise clients (200+ users) for Zoho. With Zoho also contributing to this passion of ours, we’ve partnered with the EBS team of Zoho. We’re also looking to expand our market presence by opening up offices in Banglore and Delhi for the Indian market. In North America, we are based in Toronto to handle the US market, but are looking to set up a local operation, too. We’ve been in discussion with Zoho on a couple of territories for our international expansion. Apart from Zoho, we are also working on creating a technology platform for farmers. This is our product business that is currently under development. 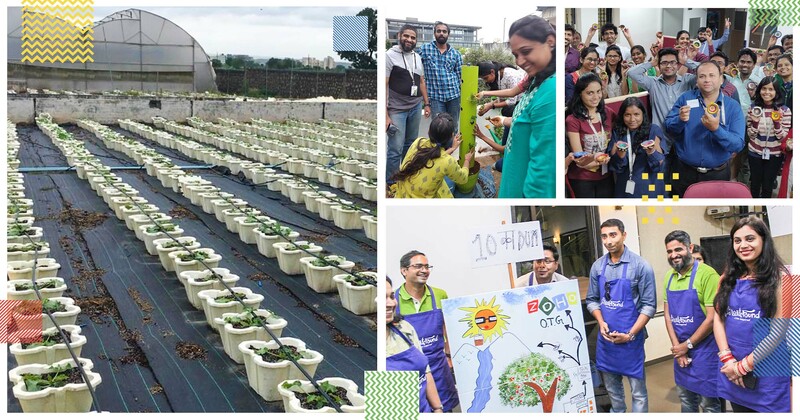 Adhya: What’s the connection between the agricultural and technical wings of Aarialife? 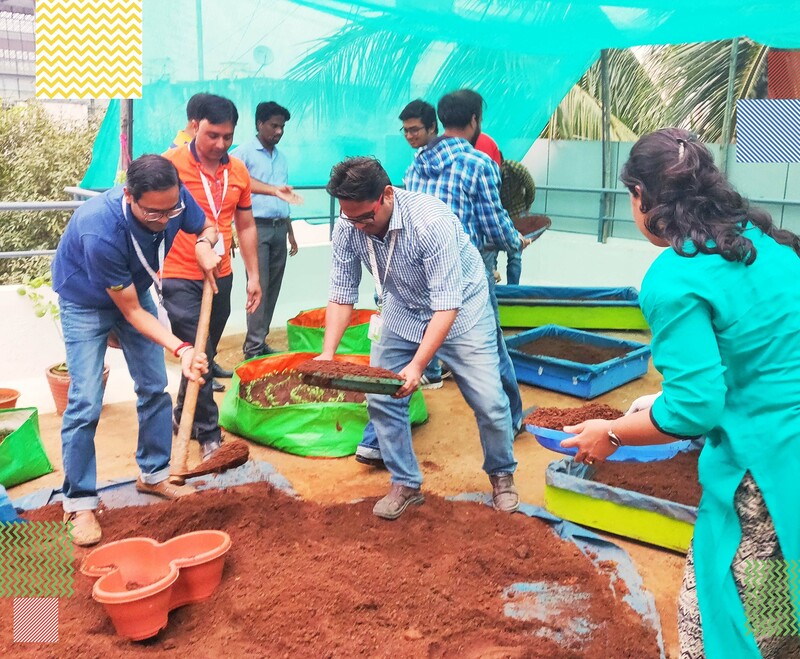 Vinay: Apart from our technology platform for the agriculture sector, I’ve personally been a proponent of “grow your own food” because 70% of the issues with human is contributed by the type of food people consume. So, our two-storey building is home to not just our office but also the food we eat. Our indoor farming practice has got the walls and terraces bearing the vegetables that our employees take home for their daily meal. So, our vision is driven by Zoho’s principle of “small office, home office,” with the small now getting bigger and better. Adhya: Wonderful! But when it comes to consulting, CRM has always been the focus. Why? Vinay: CRM has always been the easiest on cloud, because the sales guys are always travelling, and they need to be able to access data from wherever they are. But when it comes to finance and inventory management, those guys never travel! So, people start challenging the introduction of cloud software in those arenas. Today, the focus is more about running the business. People don’t want to be bogged down with the work of checking the hardware, the backup, and every other entity that is just an ancillary. So, the focus today is more than just CRM. It is about the business operating system that Zoho stands for and I believe that this improves the “business of doing business”! Adhya: Now that you’re a growing company, what are your efforts on customer retention? Vinay: From this year, we’ll be having an AMO (Account Management Office) team. Initially we weren’t ready for this massive growth, but now that we’re here, this will be our focus. The Zoho catalogue is vast with over 40 apps, and now, as we speak, another 2 might have been added, haha. So apart from renewals, this team would also be looking into up sell and cross-sell opportunities. They would be managing and engaging our existing clientele. Very nice story and inspiring.